You know about the planets, but you've never seen them like this before. Using images shot by space probes over the last forty years, Michael Benson gives us an up close and personal view of even the farthest of the planets in our solar system. The photos are absolutely stunning and you should definitely pick up this book or the original adult version, Beyond: Visions of the Interplanetary Probes, to look at them, but there are some great facts about the planets tucked in there, too. Did you know that there may once have been oceans on Venus? Or that the sun is so big that it accounts for 99.8% of all the mass in the Solar System? Or that Mars has a pink sky and sometimes has blue sunsets (the opposite of what we have on Earth)? 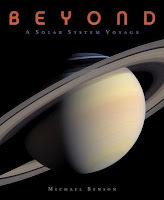 Beyond starts off with a history of astronomy from ancient times through the rapid technological advances of the 1940s, '50s, and '60s. Then Michael Benson explores each planet in detail, starting with stunning photos of the Earth. Seriously, you have to see these photos. They're huge photos of the Earth from space, but with such detail that you can see dust from African deserts blowing out to sea or a volcano exploding in Sicily. Very cool. Besides the planets, Benson also includes a section on the Sun and asteroids. The text is a little much for recreational reading. There's a lot of it in big chunks and while some interesting trivia is presented, some of it is kind of dry. I ended up skimming some sections, but what the book lacks in text it makes up for in the photos. Benson includes a glossary, photo credits, a short bibliography, and an extensive index. This book would definitely be of service to kids and teens doing reports on planets, and the photos will hook browsers. I'd pair it with The Mysterious Universe for more spectacular space photography. Happy Nonfiction Monday! Book Aunt's got the roundup, so check in and see what nonfiction everyone's reading this week. Why does nonfiction for older kids often seem to be so dry?